The surprising take home from all this is that if you wish folks to accept something as feeling true, then what one set out to do is to associate a decorative photo with it. All of a sudden much of the art of advertising makes ready sense. It also suggests that a careful choice of image can set the mood. Most important of course, those images create a desire to read and digest the text itself. Ouch! Advertising without an image is a bad idea. Obviously there is some variation in our individual responses to stimuli, but the image is really the lead driver, rather than some rational decision chain. The image establishes trust. It does not even have to be pertinent to the text involved. ScienceDaily (Aug. 8, 2012)— A picture inflates the perceived truth of true and false claims. 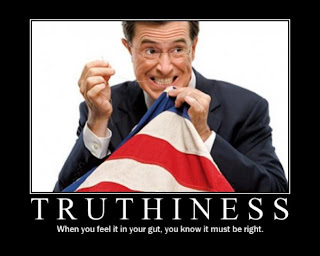 Trusting research over their guts, scientists in New Zealand and Canada examined the phenomenon Stephen Colbert, comedian and news satirist, calls "truthiness" -- the feeling that something is true. In four different experiments they discovered that people believe claims are true, regardless of whether they actually are true, when a decorative photograph appears alongside the claim. The work is published online in the Springer journal, Psychonomic Bulletin & Review. "We wanted to examine how the kinds of photos people see every day -- the ones that decorate newspaper or TV headlines, for example -- might produce "truthiness," said lead investigator Eryn J. Newman of Victoria University of Wellington, New Zealand. "We were really surprised by what we found." In a series of four experiments in both New Zealand and Canada, Newman and colleagues showed people a series of claims such as, "The liquid metal inside a thermometer is magnesium" and asked them to agree or disagree that each claim was true. In some cases, the claim appeared with a decorative photograph that didn't reveal if the claim was actually true -- such as a thermometer. Other claims appeared alone. When a decorative photograph appeared with the claim, people were more likely to agree that the claim was true, regardless of whether it was actually true. Across all the experiments, the findings fit with the idea that photos might help people conjure up images and ideas about the claim more easily than if the claim appeared by itself. "We know that when it's easy for people to bring information to mind, it 'feels' right," said Newman. The research has important implications for situations in which people encounter decorative photos, such as in the media or in education. "Decorative photos grab people's attention," Newman said. "Our research suggests that these photos might have unintended consequences, leading people to accept information because of their feelings rather than the facts."